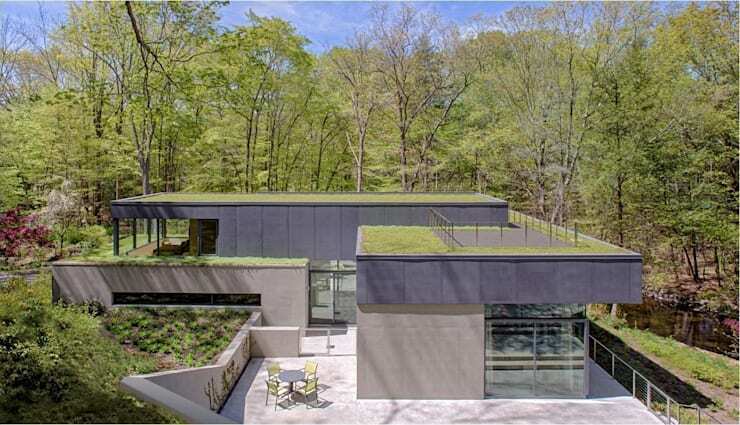 This decadent eco-friendly glass-house is nestled in the forests of Connecticut. 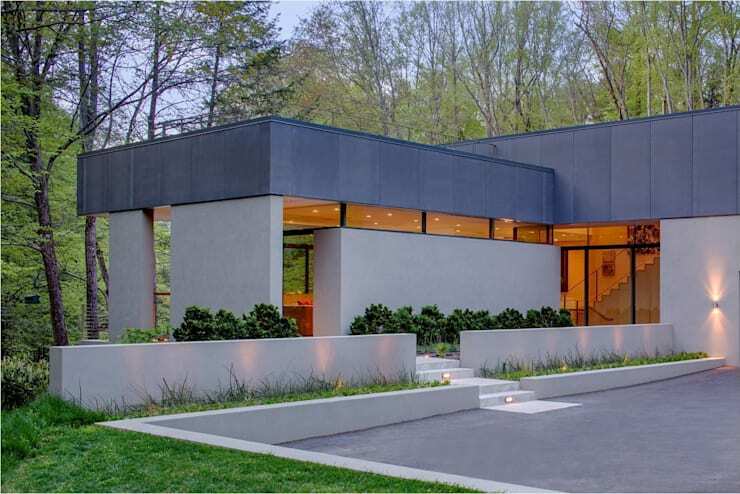 The site which is known as The Weston Residence, was designed by Specht Harpman, one of the top emerging architecture practices in the United States. The site lies in a valley adjacent to the Saugatuck River. The wider area contains a huge array of plant and animal species and much of it is protected. In deference to the eco-friendly surroundings, the designers have allowed the beauty of the landscape to play centre stage. At the same time, surprising features such as a glass-backed fireplace, lap pool and a forest bedroom, imbue the dwelling with an unparalleled sense of luxury. For beautiful images and more details, peruse the photos below. On the approach to the house, we can see how the lap pool, outdoor entertaining area and the main residence appear almost suspended in the forest surroundings. The shape of the layout hugs the slope of the land and the house is clearly harmonious with the landscape. 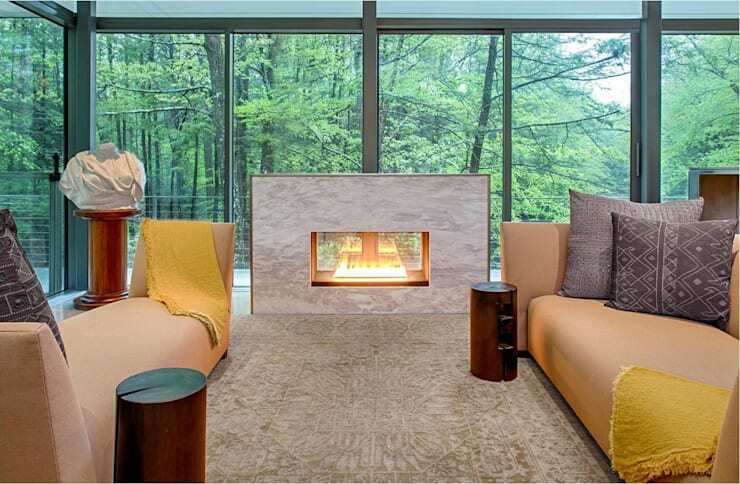 Inside the home, an elegant glass-backed fireplace provides a lovely surprise. The warm gold hues contrast with the cool, green beauty of the landscape outside. As with many glass houses, the architects here have stepped back from the material domain and allowed the landscape to play a naturally decorative role. During the day, the glass walls are transparent and at night they are reflective. Here we can see some of the rare opaque walls on the site. But even here the interior and exterior spaces are connected by views and glass portals to create material continuity. The sense of light, flow and communication between interior and exterior is ever present. While most kitchen designers resort to having the utilities butted up against a wall, this unusual kitchen consists of two kitchen islands facing each other. The great benefit here is that the flow between the living areas, cooking areas and the vast glassy expanses of natural scenery are allowed to continue uninterrupted. To finish our tour, we come to the bedroom. What a place of bliss. 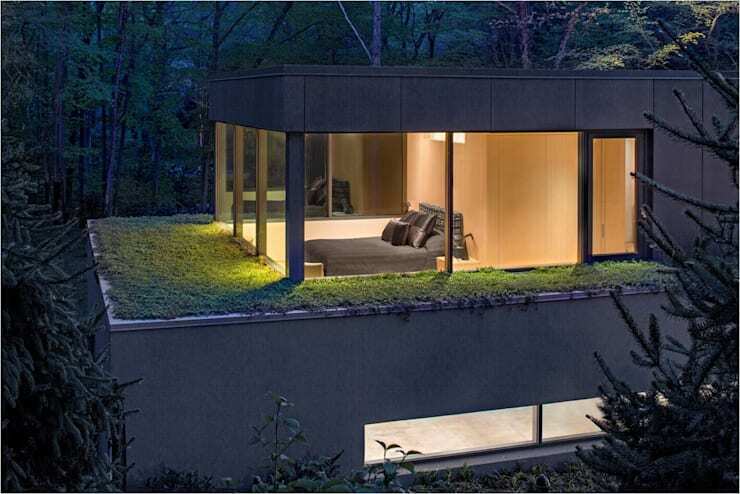 This serene layout was created by projecting the bedroom out onto the roof garden. Terraced plants planted with year-round region-specific succulents offer an ever-present greenery outside. At every point, the occupants are fully immersed in their landscape. If you enjoyed this beautiful forest dwelling, you may enjoy this Ideabook Clifftop luxury in Phuket. 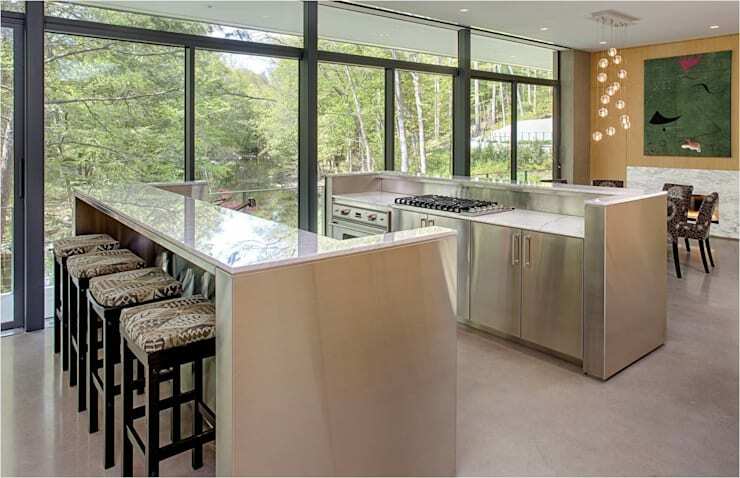 What do you think of this decadent glass house? We’d love to hear in the comments below!